On our way home from Martha's Vineyard, ABF & I made a side stop in Mystic, Connecticut. I hadn't been here since I was a kid, and I remember it being much bigger (isn't that always the way?) and more.. just.. more! It didn't take us long to walk around, and we were pretty hungry, so we stopped in The Ancient Mariner for an early dinner. We were early birds, so we got a seat right by the windows, perfect for people-watching. We both started with chowder, of course! This was delicious but different--a little less thick and creamy, but so fabulously seasoned (thyme, oregano, and who knows what else???) that I didn't miss the regular texture at all. It also had bite-size pieces of red potato that were perfectly cooked--tender but not mushy or mealy. A really different take on it! I haven't had a lobster roll in a good long while, so that's what I finally settled on (the menu there is massive!) after some hemming & hawing. There was a decent amount of meat in this roll, and it wasn't soaked in dressing. I like my lobstah rolls pretty simple. It was just a little overcooked and chewy, but still tasty. ABF ordered the bacon cheeseburger. He gave me a bite (such a nice guy) and it was good, but I was happy with my lobstah. For dessert, ABF had no problem picking the special that day: Irish Soda Bread pudding. I didn't think much of this in print, but ABF kindly shared a bite with me, and it was 'shut-your-mouth' delicious. Wow. This was outstanding. Out. STAND. Ing! So much so that I had two more bites, even though I was saving room for my ice cream later (post here). It came with a whiskey sauce that had just enough bite and sweetness to cap off the dish. That pudding. Wow. I think ABF is going to have his mom make EXTRA soda bread next St. Patrick's Day so he can try his hand at recreating this! 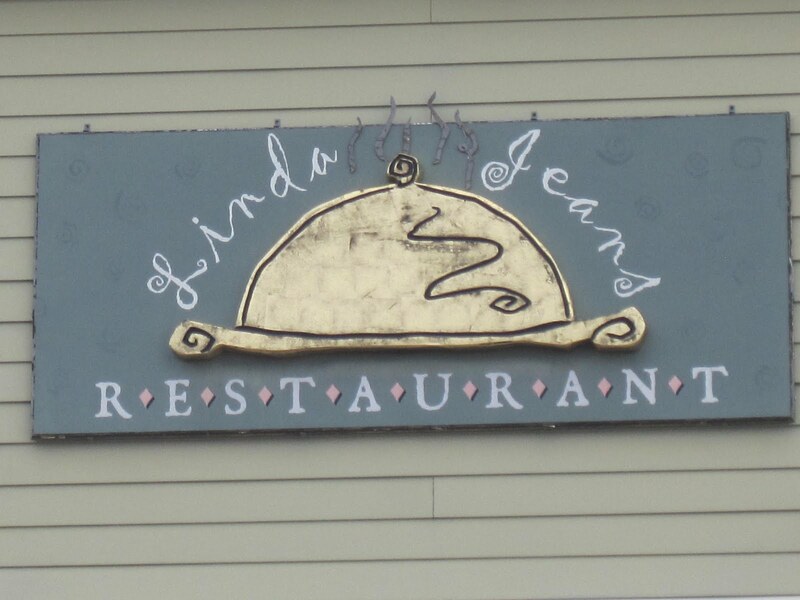 We had great service through the whole meal, and the food was good. They had good drink specials, too. 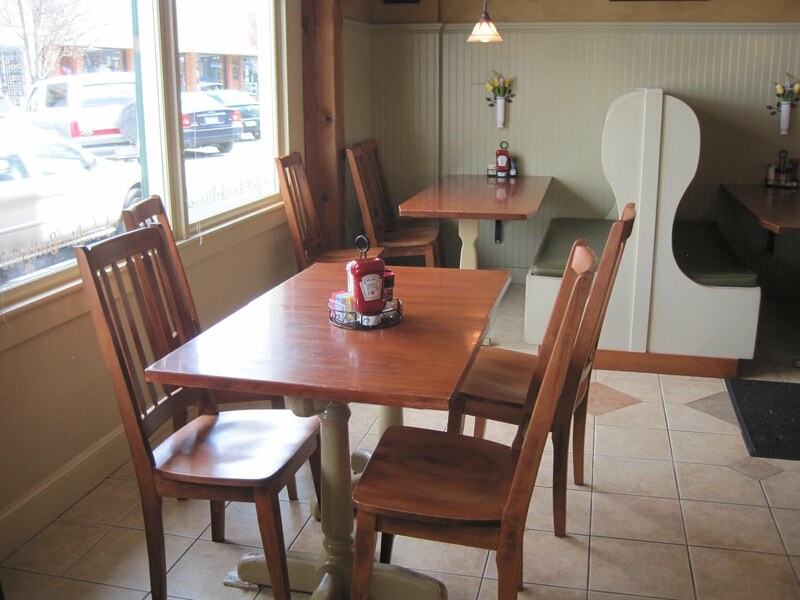 If you're passing through Mystic, stop in for a good meal--and if that Irish soda bread pudding is there, order it. I have a serious affinity for Black Raspberry ice cream. It reminds me of happy, sandy, sunny summer days in Cape Cod and Rhode Island, where our family spent a lot of time as I grew up. If there is a Black Raspberry available, I'm going to POUNCE on that. I'll take that over a sundae (okay, maybe not a Butterfudge at Bliss) any day! While ABF ordered his Irish Soda Bread pudding (!!!) at The Ancient Mariner (post here! 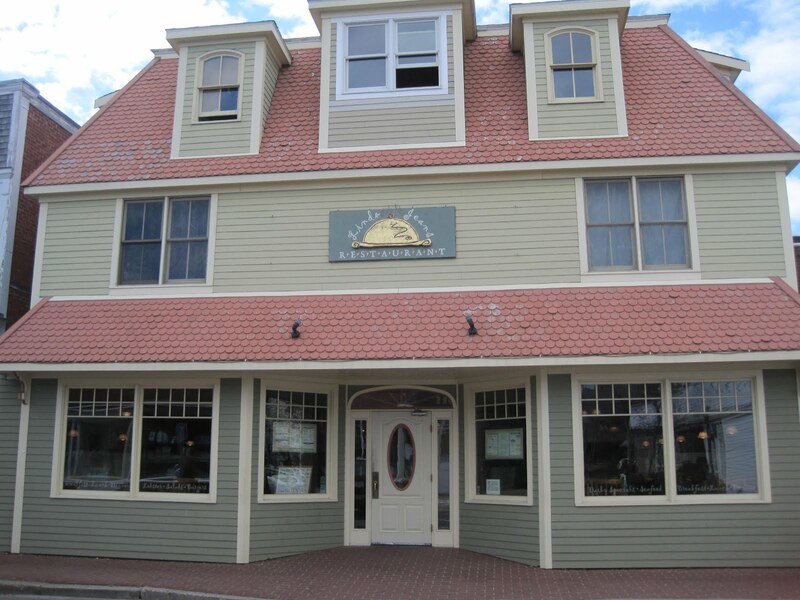 ), I was saving room for a stop down the street--- Mystic Drawbridge Ice Cream, which is literally steps from the drawbridge that goes over the river. There are a lot a lot a LOT of tempting options to consider there, from amazing flavors to fabulous sundae concoctions, but ABF kept trying to keep me focused on the plain old scoop of black raspberry. The line was out the door and moving quickly, so I didn't ask for a sample like I normally would. I ordered the sugar cone of Black Raspberry and kept moving. I don't know WHAT is up with this--it had a funny, odd texture, almost like it had melted before and then refrozen, or there was some sort of artificial flavoring. It was hands down the worst black raspberry ice cream I've ever tasted. It was chewy in a most unappetizing way. I took 2 or 3 bites before tossing it in the garbage. I guarantee I have never done that before! Le sigh. I'm not saying DON'T go to this place, because it obviously had a great reputation and is highly rated by locals and tourists alike--just don't get the black raspberry. Ayhan's is a delicious, dependable spot where you can eat a scrumptious dinner and still leave feeling like you're being pretty healthy (if that's what you're after, I mean). First order of business--a bright, light pinot grigio to start off my meal--yum! The bread dip at Ayhan's is the #1 reason I keep coming back. It reminds me of a Martha Stewart recipe I learned ages ago (but rarely make at home because bread is kind of a weak spot for me--I can't be left alone with it!) --oregano, lemon juice, olive oil, and other spices. This is cracktastic and I will dip any and every piece of bread I can find into this dip. I usually get a chicken kabob, but the Energy Platter jumped out at me: 2 falafel, hummus, tabouleh, pita bread, and a farmer's salad. The falafel were just okay, but I liked that they were small and about the size of a big olive, not huge portions. The hummus was really good, the tabouleh ok (I'm not a fan), but the farmer's salad was OUTSTANDING. I think I need to make this at home at least once a week! Diced cucumber, bell pepper, tangy red onion, and bits of feta cheese. Divine. ABF got the classic Greek salad, and while they could totally just phone it in, here, Ayhan delivers a killer vinaigrette that jazzes up the whole dish. ABF ordered his favorite--the sirloin kebabs, which came with two big chunks of perfectly charred, cooked steak, and a mushy but (so I'm told) tasty tomato in the middle. It also came with delicious rice pilaf and veggies. We almost always get dessert at Ayhan's (unless we really pack in the bread--and yes, that can happen! ), and this time we made room for our favorite dessert there: galactaboureiko, which is layers of phyllo dough alternating with delicious custard. They usually serve it hot, but ABF prefers it cold (note: it's better hot). I'm a nice girlfriend, so we got it cold. Either way, it's scrumptious--not as sweet as baklava but still a tasty way to end a delicious meal. I started with the garlic soup. We had the same server as last time (Caitlin) and she told me the soup had a poached egg (!) from Grey Barn Farms, a chicken broth base, puréed bread crumbs for thickness, and oodles of garlic, plus a ramp-butter crostini. Done and done. I like ramps (some people, especially in NYC, go insane for them), so I figured it was a perfect taste of spring flavors. This was BEYOND good. I have to figure out how to make this! It must have been roasted garlic, because the flavor was slightly sweet and mild, nothing raw or pungent about it. ABF had more than one spoonful of this because it is THAT GOOD. That egg--look at the gorgeous yolk! ABF sampled the bread basket while I ate my soup--delicious. ABF ordered the steak dish, which came with sautéed spinach and buttermilk-onion rings. I loved the onions and sneaked a good 2 mouthfuls of the crunchy bits. The steak was super tender and wonderfully seasoned, and the garlic was just right. ABF was hoping for MORE of it, but he did enjoy it. It also came with these fabulous pasta pockets filled with short ribs. Melt-in-your-mouth good! I went in determined to save room for dinner, so for my entrée, I ordered the Menemsha Lobster Spaghetti, which had pasta made from Grey Barn Farms eggs, roasted tomatoes, local pea greens and asparagus. This was beautiful, but I felt like something was missing and it fell a little flat with me. It was very good, I just didn't fall in love with it like I did with the breakfasts we had last year. Still, a tasty, decent-sized portion that left me with plenty of room for dessert! And oh, this dessert was worth it. Salted whiskey butterscotch pudding. So many awesome words in that title! YES! It had a great tang of salt, creamy butterscotch flavor, and sublime peanut brittle on top. When did I start liking peanut brittle? Oh right--the SECOND I tried the peanut brittle at State Road. ABF ordered the flourless chocolate cake, but this didn't win over either one of us. It had a crumbly texture and made me think of more of a semolina cake than the dense, fudgy, richer version we were both picturing. If you want something very light, though, this would be a good pick. I'd rather have more more more of that butterscotch pudding. A lot more! We saw a final sweet treat arrive with our check--2 delicious, light-as-air macaroons. I don't really care for coconut's texture, but for some reason I love it in macaroon form. These were great! While the dinner still didn't surpass our remarkable breakfast from last fall, we still highly recommend State Road. Great service, fresh, local food, and love in every bite. Enjoy! A great hotel deal & some stunning weather were more than enough to lure ABF & me back to Martha's Vineyard this April. A favorite spot of ABF's on MV is Linda Jean's, which is in the Oak Bluffs area(home to the gingerbread houses and more). We didn't make it there last trip, so we made sure to stop by this time! They'd stopped serving breakfast, but I had just heard (via my Facebook page--go there and like me, won't you? Aww, thank you so much!) 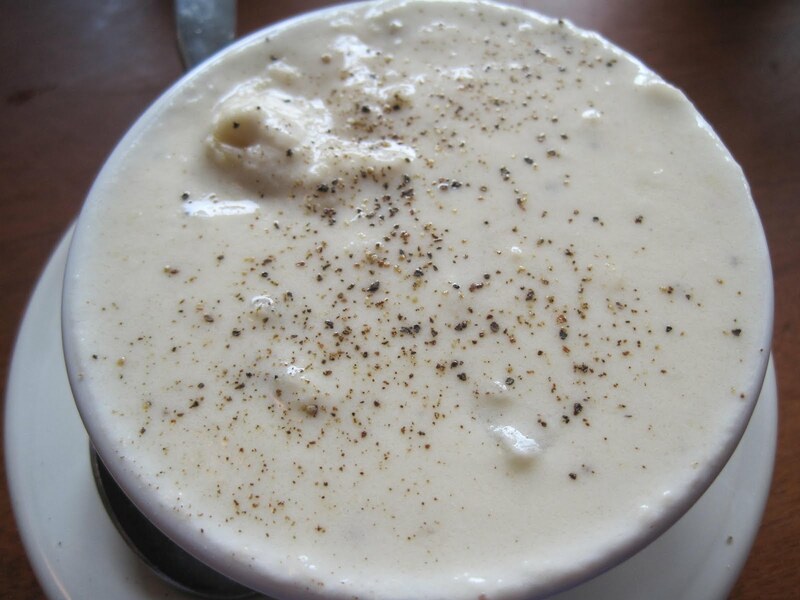 that their chowder was some of the best on the Island. Done! ABF & I each got a bowl. I am always impressed how such a simple dish can be so vastly different from place to place. This WAS good, but I think my heart still belongs to the chowdah at Newes from America pub, at least in a MV chowdah ranking. 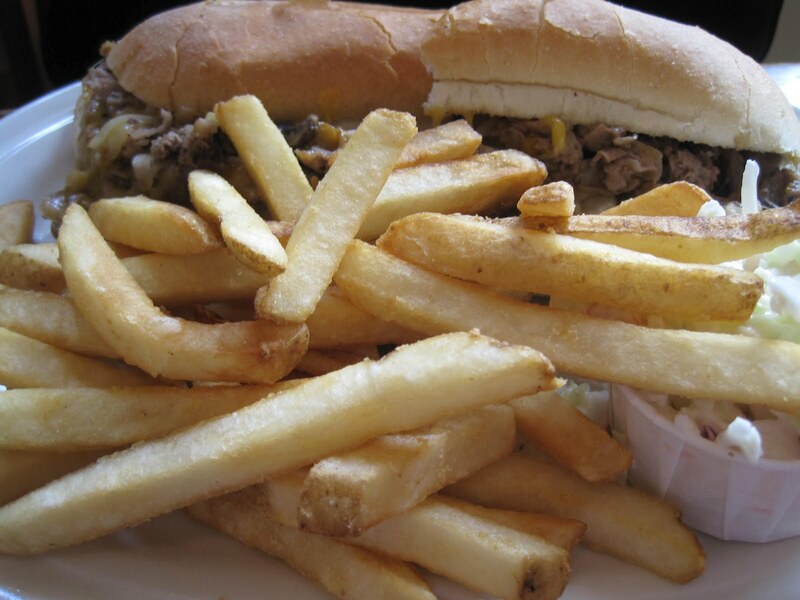 ABF ordered Linda-Jean's steak sandwich, a play on a philly cheese steak. This was a lot of food and chock full of delicious mushrooms (yes, I said MUSHROOMS--and delicious--in the same sentence!). I took TWO bites of this. The roll was perfectly soft and everything--tender beef, melty cheese, yummy mushrooms, was seasoned just right. 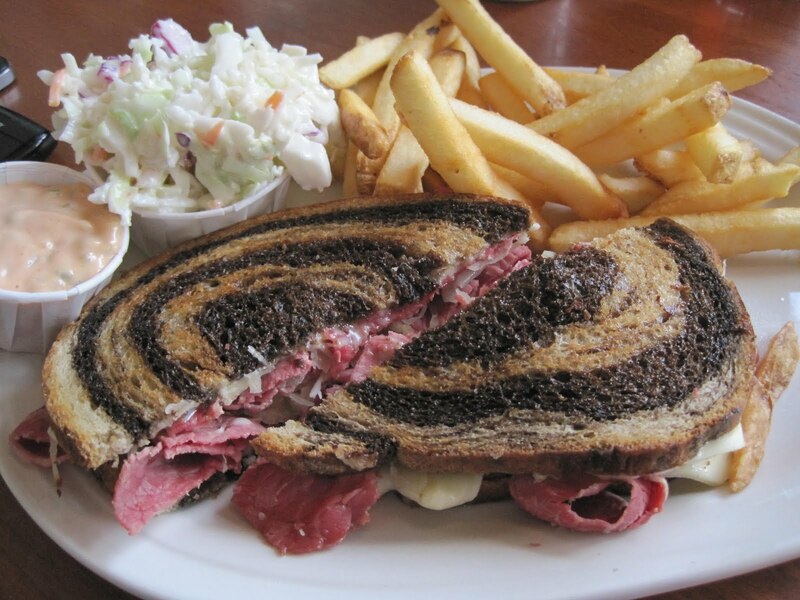 I ordered the grilled Rueben on rye bread. I love me some sauerkraut and it just jumped out at me. I was glad to see it was not a ridiculously huge serving (like you might find here in NYC). This was a normal person's sandwich--and I still couldn't finish it. But oh was it yummy. 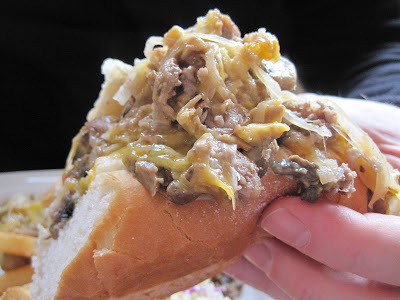 The bread was perfect, the meat was easy to chew but not mushy, and the melty cheese and sauerkraut were the perfect combo of gooey and crunchy. I didn't really use the Russian dressing on the side (very sweet and kinda not my thing anyway). The fries were good, too--I ate more than I planned to eat! 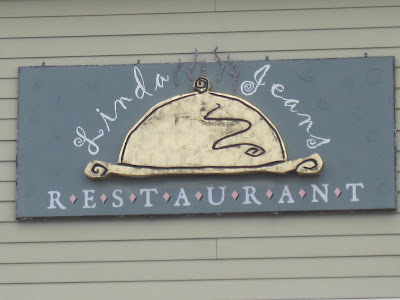 Linda Jean's is open all day--next time I'm aiming for breakfast, because I remember having some pretty fantastic pancakes there a while ago. They're located smack in the middle of Oak Bluffs...and let me know what you get there!! Why on EARTH would I refuse the chance to spend a few hours drinking one of my favorite things (wine) and eating one of my favorite cuisines (Tex-Mex)? Of course I signed ABF & myself up ASAP for our second class at NY Vinters, a tiny but welcoming (and expandable) space in Tribeca. It's steps from City Hall and several subway lines, FYI. ABF & I attended a pinot noir class there ages ago, and we were so impressed that I couldn't wait to find another reason to return. We've been to other wine classes before--NYV just blows away any competition. I expected a much more informal setting, imagining we'd be getting small tastes of everything, not entire courses in lovely settings. We had a few sips of bubbly upon arrival (such a nice touch!) I'm not a fan of carbonation, but I didn't let that stop me ;) This was the Gruet Blanc de Noir, and it is the only non-Champagne (France) region winemaker allowed to put "methode champenoise" on their labels. Impressive! These whites went with our first course: a tamale. My heart sank a little at first because I do not like tamales do not like no thank you but oh wait..this was AMAZING. The secret(s)? Duck fat instead of lard, organic pork belly, intoxicating cilantro pesto and a whole lot of skill from NYV's Executive Chef Ryan Smith. I ate every single bite of this, from the micro-cilantro on top to the freeze-dried corn kernels surrounding the plate. Wow. Each bite was savory, satsifying, and shut-your-mouth delicious. If I had no shame whatsoever, I'd have asked for a second helping. Wowsa. The dish brought out the fruitiness of the Torrontes, and was especially dreamy with the Riesling. Our second course was a bubbling cauldron of cheesy goodness--queso fresco, piquillo peppers, tiny, chewy dices of chorizo, and a match made in heaven with the white wines. The fattiness of the cheese disk was cut by the slightly sweet, acidic whites. Love. Our final dish of the evening was as stellar as I'd come to expect by now. What amazing food! This dish was a chili made from Colorado lamb, which Chef Ryan says is his personal favorite. Forget New Zealand, he said--go with Colorado. There was a nice chipotle smokiness to this dish, and the sunchokes (which are the root of sunflower plant--did you know that? I didn't know that!) were a nice, slightly crunchy contrast to the soft, succulent bits of lamb. Also? Not a WHIFF of that gamey flavor that has put me off lamb most of the time. The richness of the lamb completely tamed the Priorat--so much that I brought home a bottle! I can't say enough about how well NY Vinters does these classes. Not only is it delicious wine, it's a welcoming atmosphere without a drop of pretension. You want stuffy and no fun? Go somewhere else. You want approachable, knowledgeable people who want you to love wine and food as much as they do? Come to NY Vinters!! It's crazy convenient, quite affordable, and just the best in town. Cheers!